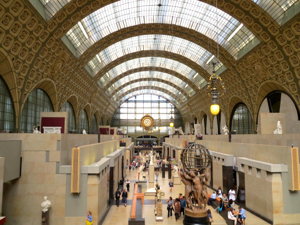 Once a railroad station, this Paris museum now houses an outstanding collection of Impressionists and other art of the 19th and early 20th centuries. 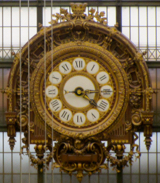 Ornate clock in the grand hall, Musée d'Orsay. An old building, a new museum: that's Paris's Musée d'Orsay, on the Left Bank not far from the boulevard St-Germain (map). A former train station, the elegant building is a familiar site along the Seine (closed Mondays). from a Seine river boat, or from the right bank. The thousands of paintings, sculptures, photographs, items of furniture, and architectural displays in 80 galleries are right at home in this grand edifice built in the Age of Steam. 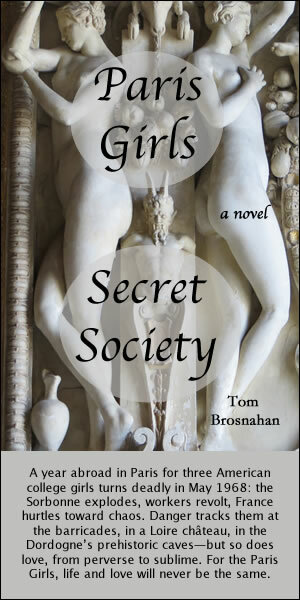 The building itself competes with its marvelous exhibits for your attention. The Impressionists are largely on the 5th level. From the far end of the Central Aisle where you enter, you can take a direct escalator to Level 5. 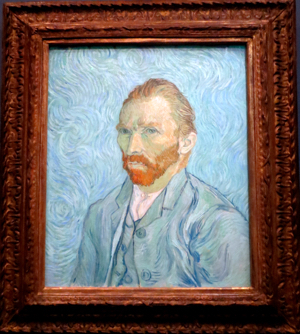 Familiar names abound in these galleries: Cézanne, Degas, Gauguin, Manet, Matisse, Monet, Renoir, Toulouse-Lautrec, Van Gogh, and more—even Whistler. Vincent Van Gogh, Self Portrait, 1889. Level 2 comprises academism, naturalism, symbolism, and Art Nouveau, with works by Bonnard, Claudel, Klimt, Rodin, Vuilllard, and others. The sculptures on the Seine Terrace and the Lille Terrace are wonderful and also provide great vantage points to enjoy the building. The large second floor rooms with their curved ceilings are elegant in themselves and house some of the Musée d'Orsay's largest paintings. The ground floor is titled pre-Impressionism and includes more familiar names such as Corot, Daumier, Degas, Delacroix, Ingres, Manet, Monet, Renoir, Viollet-le-Duc and others. Manet's famous Le Déjeuner Sur l'Herbe is on display on this level. There's so much to see here that some people never get any farther on their first visit. As you tour, also appreciate the beautiful architecture of the building. On level 5 you can find yourself behind—and looking through—the wonderful large railroad clocks that are a signature feature of the building. 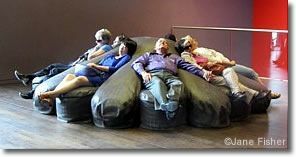 Look for the comfy couches here too if you need to rest your weary feet. The terrace is open on some days, depending on the temperature and humidity. If it's open, be sure to go out and enjoy the wonderful views of Paris. Access is through the restaurant Café des Hauteurs, a nice place for lunch. Featuring a simple menu and an artistic setting in itself, it's a great place to recharge and relax during your visit to this large and comprehensive museum. Other food options range from the elegant restaurant on the second level, a former ballroom with huge chandeliers and lots of gold, to the 6th floor take-out, with pre-packaged sandwiches and salads, snacks, drinks, and French pastries. The Musée d'Orsay is just across the Seine from the Jardin des Tuileries and the Orangerie, home of Monet's water lilies. Click here to order your ticket(s) in advance and skip the ticket line. Paris Pass and Paris Museum Pass accepted. Also combination tickets are available with the Orangerie and the Rodin Museum. Closed Monday. Open Thursday evening. 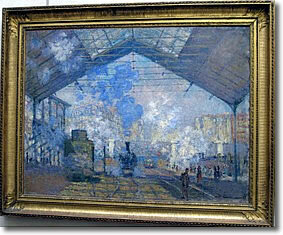 Below, Monet's Gare St Lazare, Paris. Monet's Gare St Lazare, Paris. to relax at the Musée d'Orsay. 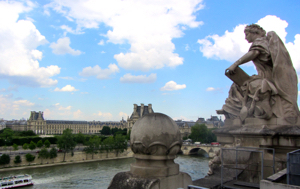 Below, Lovely view from the terrace of the Musée d'Orsay, looking across the Seine to the Louvre.